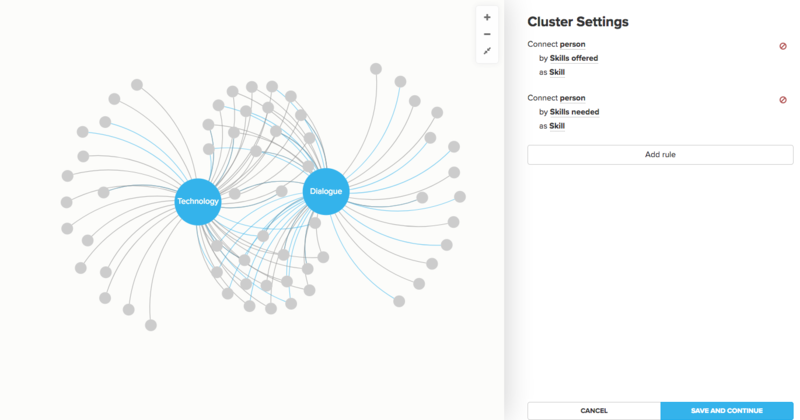 Clustering is a powerful tool that allows you to connect elements based on the data in their fields, and it&apos;s particularly useful on stakeholder and network maps. 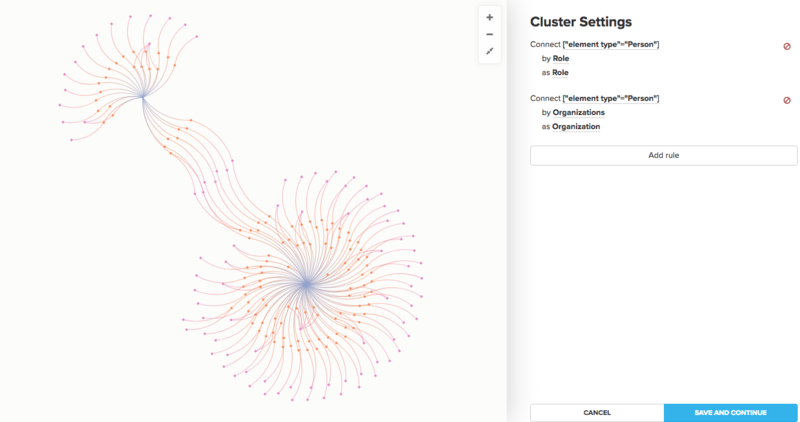 When clustering is activated, Kumu will create new elements to represent each possible value for a field of your choice, and it will draw a connection between your elements and the value(s) in their field. 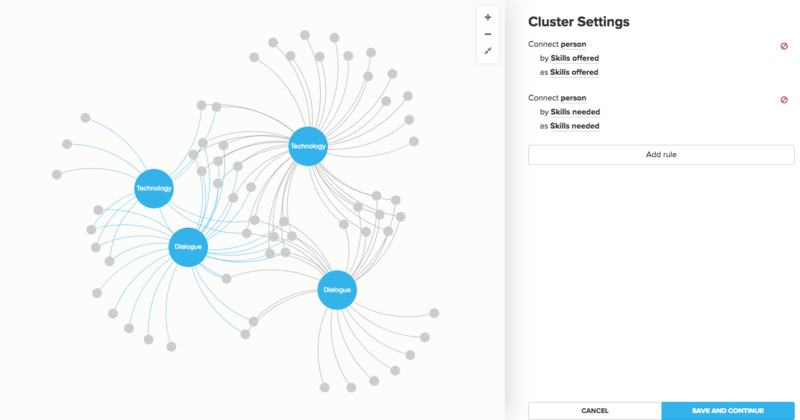 This guide will make you an expert on clustering, one of Kumu&apos;s most unique and powerful tools! Not that eye opening, right? You could click on each element to open its profile, allowing you to see each person&apos;s organization, but it would take you a long time to gain any insight into your data. Voila! 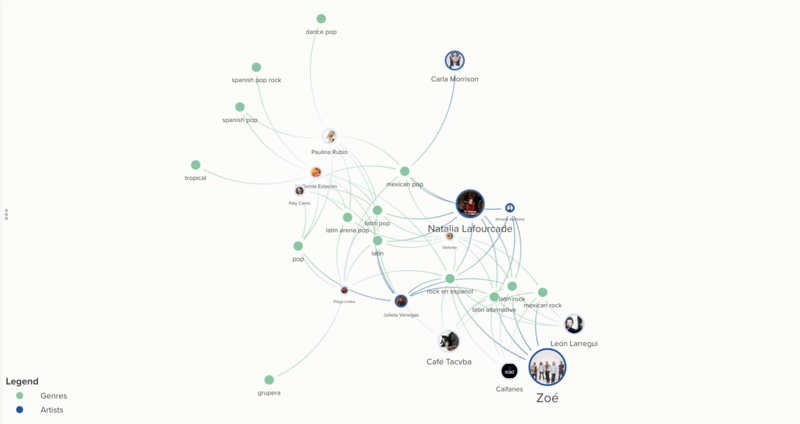 We used clustering to transform a rigid spreadsheet into a relationship map of all the people and organizations they work for. If you need to restrict clustering to certain elements, cluster by more than one field, or customize the element type of the elements created by clustering, learn how to fine-tune your cluster settings. Just replace Field with the name of any field in your project, and any element with data in that field with be clustered! All elements on the map will be clustered by the field you chose. 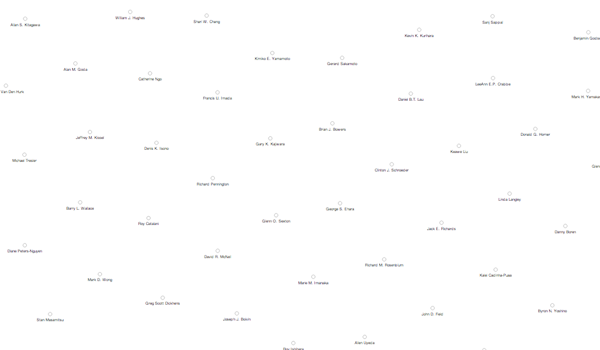 You can only cluster by one field. The new elements that get created by clustering will use the name of the cluster field as their element type (for example, if you cluster by "Organization", the created elements will have the element type "Organization"). These default rules often won&apos;t cause any problems for your map, but there are some cases where you will want to override them. To do that, you can use either the Basic Editor or Advanced Editor to fine-tune your cluster settings. Click the Add rule button to create a new cluster rule. Then, click next to "Connect" to bring up the Selector Builder, which allows you to narrow the selection of elements that will be clustered. 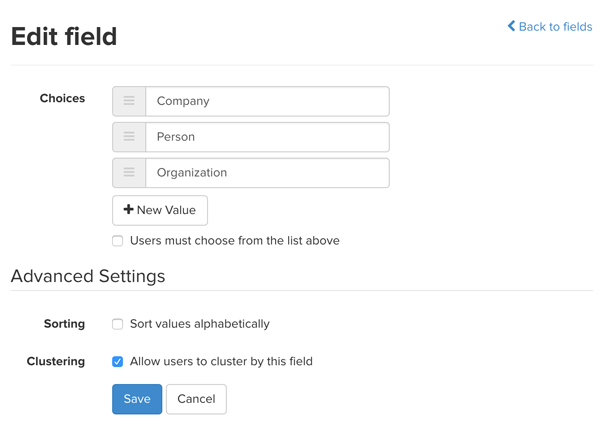 If you want to cluster by more than one field, just click the Add rule button and repeat the process! Replace selector with any valid selector. Replace Field with the name of the field you want to cluster by, and replace Type with the value that Kumu should set as the element type for each element created by clustering (make sure your Field and Type are wrapped in double quotes). 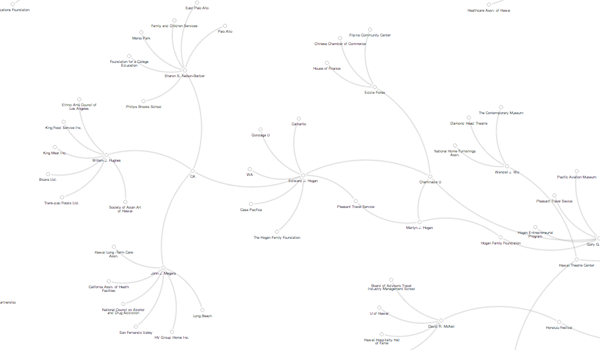 Here&apos;s an example that clusters all elements with the element type "Person" by their organization. The organizations that are added to the map will have the type "Organization". When is it useful to fine-tune element type? Fine-tuning the element type is useful when you want to make sure that Kumu re-uses existing elements instead of creating new elements through clustering. When Kumu is about to create a new clustering element, it first searches the entire project for an element with a matching Label and Type. If it finds a match (on any map), it will re-use that element (complete with any Description, Tags, and custom field data as well). 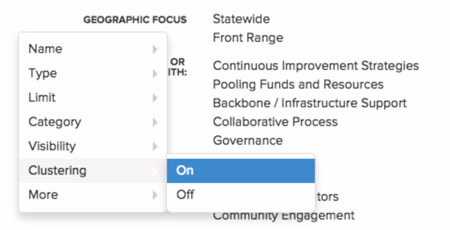 One use case for this feature is cross-matching multiple fields, such as "Skills needed" and "Skills offered". In that case, you&apos;re probably looking to see the overlap between who&apos;s looking to learn a skill and who might be able to teach it. To start, you would cluster all elements by "Skills offered", then add a second rule to cluster all elements by "Skills needed". If you don&apos;t customize the type of the elements created by this cluster setting, the types will default to "Skills offered" and "Skills needed", and you&apos;ll get two separate elements for each skill: one with the type "Skills offered" and the other with the type "Skills needed". But, if you set the element types to "Skill" for both clustering rules, Kumu will create only one element for each skill value—even though the values originated in different fields.